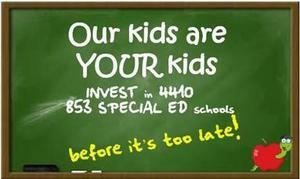 Tell Governor Cuomo - Our Kids are YOUR Kids! These words were taken directly from the Governor’s 2019 Justice Agenda presentation - but what about children with disabilities attending 4410 special education preschools and 853 special education schools? There’s no mention of students with disabilities. Don’t children with disabilities, who need more support than a school district can provide, and are referred to 4410 preschools and 853 schools by the Committees on Special Education because no other program can meet their needs, also deserve “the same quality education”? The Governor proudly states that since 2011 education aid has increased by 42%. 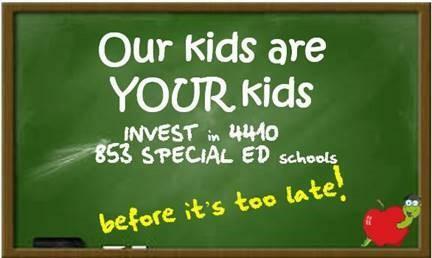 During this same period, 853 special education schools have received 22% and 4410 preschools have received just 8%! This lack of funding prevents our schools from paying teachers’ salaries anywhere near what school districts pay. Teachers who work for school districts also work 10 months rather than 12 as our teachers do, and have far superior benefits. Our teachers earn between $20,000 and $40,000 less than teachers who work for school districts. The average turnover rate in our schools is over 28%! The vacancy rate for our schools is 28% - that means that more than 1 in 4 teaching positions remains unfilled! Kids with disabilities ARE entitled to the same quality education that every kid in New York State is entitled to! A Justice Agenda that leaves out students with disabilities is UNJUST! While school districts have received 42% in increased funding since 2011, 853 schools have received 22% and 4410 preschools have received just 8%! The resulting salary differential between our teachers and school district teachers is $20,000 - $40,000 and our teachers work 12 months (instead of 10) with inferior benefits! The resulting average turnover rate is 28.5% and our kids need consistency more than others! The vacancy rate is 28% – without teachers, our kids are being denied a quality education! This is a crisis that MUST be addressed NOW! Find your Legislators’ and the Governor’s contact info here.